I remember the good old days back when Tetris could only be played on the relic that is the GameBoy and how amazing and addictive it was! 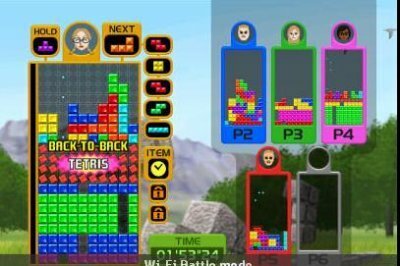 Well now with Tetris Party it’s been revamped for the Nintendo Wii console and has more options, I find it more addictive as it had me up until the early hours of the morning. You can play multiplayer as well, so if you have a sibling, other half or pet that you fancy showing up, then crack on! All the games are great fun to play, with Shadow probably being my best one as it different. The shadows are all different, starting off with an apple. Plus you have a time limit, so you have to be quick without making mistakes, otherwise its game over! Online and Computer Battle are the same game, just against Wii or pathetic human! – I had one guy asking me to take it easy on him the other day!! I just laughed and destroyed him!! To beat your opponents, you have to get as many lines as fast as you can as to make your opponents side fill up with the lines you’ve just made – Your best bet is to get 4 at a time as much as you can!! With the online mode, you can do either 1 on 1 or join a battle against multiple opponents who all want to lose!!! Field Climber is good fun too, as you have to help the little fellow out from the bottom of the board and get him out. So this game actually encourages you to be bad, in a way, but you still have to be careful so you don’t get him trapped. I think that the only thing really missing from this game is a retro option, where you can play Tetris like is used to be with the old arcade style tunes. They have put in an old tune in the game, but they’ve redone it. The use of the Wii Balance Board is brilliant and really adds a different angle to the game. The controls are really easy to get used to and the Tetris board is smaller than the standard version, which is a really good idea because it’s tiring enough with what you’ve got!! To move your pieces, or, “Tetriminos”, all you have to do is lean to the left or the right on the board. To turn your piece you have to squat (just imagine watching someone play this), and to move your pieces down faster, either lean forwards or backwards. It really is good fun to use the board and gives Tetris Party that extra depth. It looks nice to play as well. 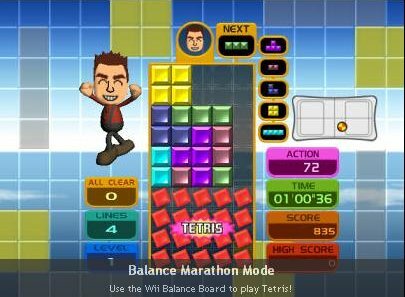 You can’t really do much with Tetris as it’s not a game for how good the graphics are, but it is pleasing to the eye and you can even see your Mii character next to the board whilst you play. Tetris Party is a great classic game that’s been given extra life and is still great fun to play after all these years. Definitely worth the download whether you’re a fan or not! However, I do feel that 1200 Wii Points is a bit too much and should maybe be around the 800 — 1000 mark. But it is Tetris after all! !